For consulting cover letters, a professional tone and an emphasis on industry achievements are critical. 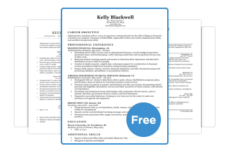 Download our cover letter sample for free. If you’d like to take a more hands-on approach, read our expert advice for writing your own cover letter. Quickly connect with hiring managers by using our intelligent cover letter builder. Create a personalized cover letter in minutes with its intuitive design and simple questionnaire. There are dozens of cover letter samples to choose from in our comprehensive list of industry-specific cover letters. I noticed your recent job listing seeking professional consultants. I’ve always admired the work of your well-known firm, and it would be a privilege to contribute my consulting talents and ensure even greater success at [Company Name]. 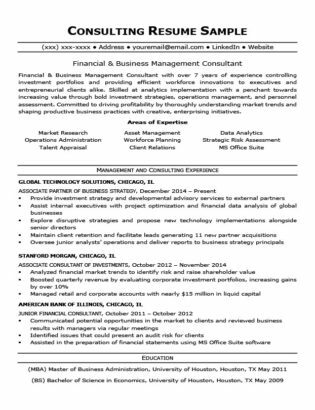 I’ve provided financial and business management consulting services for the last 4 years working at Global Technology Solutions. Within that time, I’ve helped upstarts and industry veterans alike develop efficient workforce solutions and investment strategies. As an Associate Partner of Business Strategy, I was tasked with appraising the internal operations of global businesses and implement cost-saving strategies. Previously, I managed high-level investment portfolios as an Associate Consultant of Investments for an international bank. [Company Name] has achieved unbelievable success over the years and I’m certain you won’t employ just anyone. My prior consulting experience has driven growth, cut wasteful expenses, and increased shareholder for my clients. I would be thrilled to offer these skills to [Company Name]. Thank you for your consideration for this position. I’m excited to hearing from you. Your cover letter is a chance to explain aspects of your resume before a hiring manager takes a look at it. Because consulting is such a competitive industry to break into, employers aren’t going to painstakingly review each and every application. That’s why you absolutely have to put your best foot forward when writing your cover letter. Highlight the three most impressive bullet-points from your professional experience section. Consultants are interested in how you succeeded in bringing value to prior clients, as well as the company. Our cover letter sample pulled their top achievements directly from their resume. The bullet-point formatting ensures that they won’t get buried inside lengthy paragraphs. A busy hiring manager could easily overlook these standout figures if you merely wrote them out in complete sentences. Don’t go off on tangents and don’t try to weave some tale about how great of consultant you are. You aren’t going to impress anyone by showboating, so keep it brief and write in a professional tone. Stick to writing examples of how you succeeded in your previous consulting job. Throughout history, no one has ever been more capable at implementing out of this world workforce solutions and billionaire-level investment strategies. Don’t be too boastful in your cover letter, it isn’t going to help you land an interview. It’s very unbecoming and your cover letter is going to end up being passed around the office for everyone to laugh at. You don’t want to be that person. Keep it professional. The ideal length of your cover letter should be roughly three paragraphs. Close out the final paragraph by demonstrating that you’re familiar with the business you’ve just applied to. A simple Google search is all it takes to find some information about your potential employer. Mention that you’ve heard of and admire their past work. Wrap up your cover letter by letting them know how thankful you would be to work for them. Let them know that your skills as a consultant would be beneficial to their business if they decide to hire you. 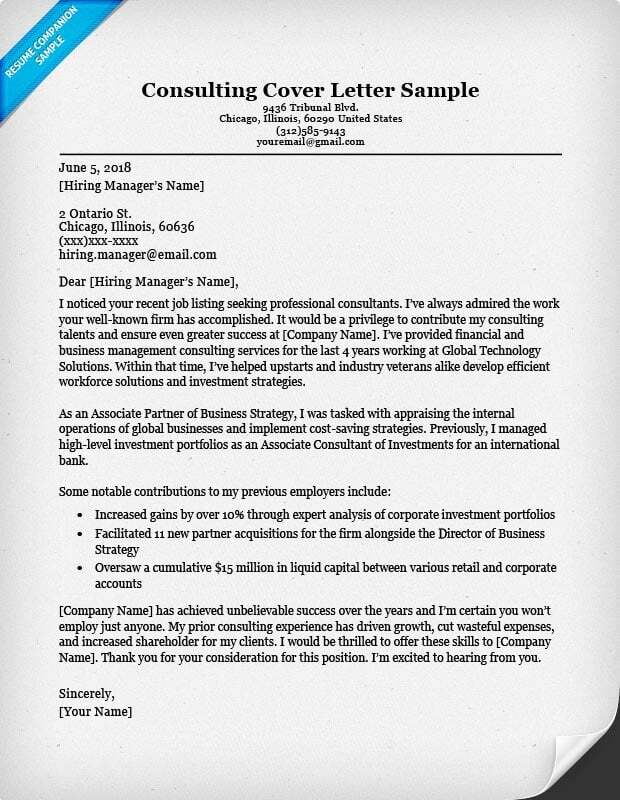 Utilize these cover letter writing tips and get your consulting career started today!